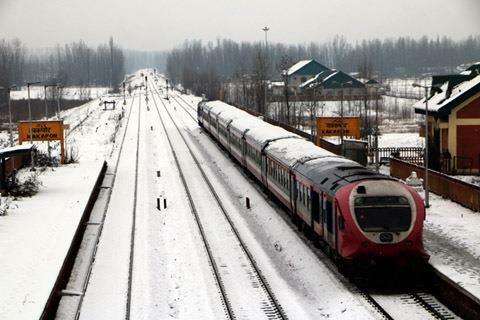 Srinagar, Feb 9: Train services remained suspended for the third day on Saturday in the Kashmir valley, where separatists have called for a general strike on the 6th death anniversary of Parliament attack convict Mohammad Afzal Guru, who was hanged in Delhi’s Tihar jail on this day in 2013. On February 7 and 8 train service remained suspended due to heavy to very snowfall which had also frozen due to sub-zero temperature. "We have received an advisory on Friday night to suspend train service as a precautionary measure in the Kashmir valley", a senior railway official told TNN. He said, therefore, no train will chug on Srinagar-Badgam and Baramulla in north Kashmir track for the third day. Similarly, no train will run on Srinagar-Anantnag-Qazigund in south Kashmir to Banihal in Jammu region. Train service will be resumed only after receiving a green signal from the authorities, he said adding we are acting on the advice of local administration who are taking a decision keeping in view the safety and security of the passengers, railway staff and property. He said in the past railway suffered damage in demonstrations during strikes and encounters. Train service has become very popular in the valley as it is being considered safe, fast and cheap against another mode of transport.